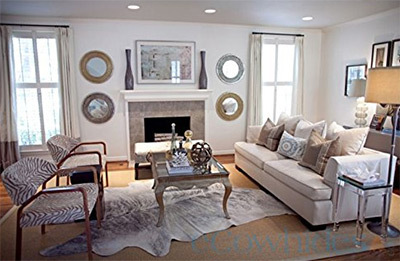 A quality cowhide rug makes for a strong accent piece that feels subtle yet dazzling. It’s certainly not for everyone but this rug is a common choice in southern, contemporary, and eclectic homes. I can’t tell you one specific cowhide to pick since they all come in many shapes, sizes, colors, and styles. 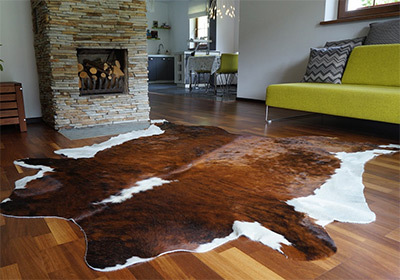 But in this post I’ll share some of the best cowhide rugs you can choose from and what to look for. 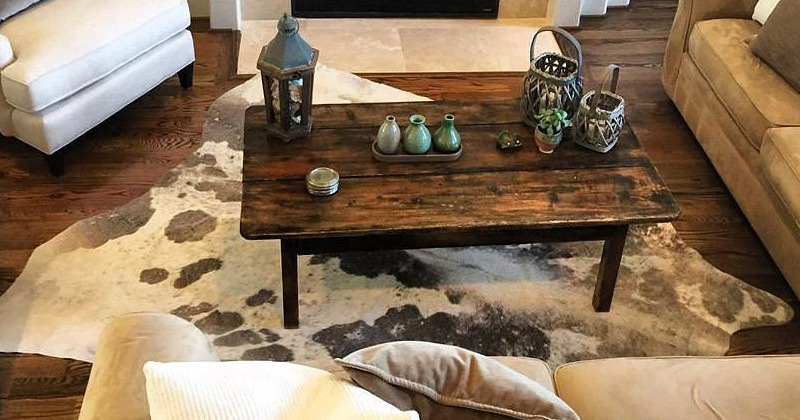 Just remember that with these cowhide rugs you always get what you pay for. Quality rugs tend to last longer, feel softer, and have a quality “shine” to the pelt that you just won’t get with cheaper alternatives. If you already know what style you want then selecting a rug will be easy. There are dozens of colors and sizes to choose from so finding what you like is a great place to start. You’ll also need to consider price and material. If the manufacturer uses faux fur materials would that be OK? Or do you prefer a real hide material like the rugs in this guide? Real cowhide costs more but it also lasts much longer. 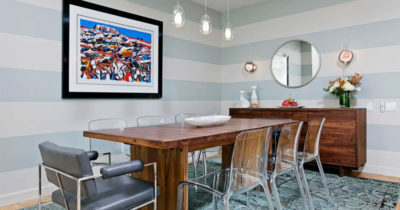 Naturally the color scheme is often the most important aspect because you need the right colors to blend with your home. 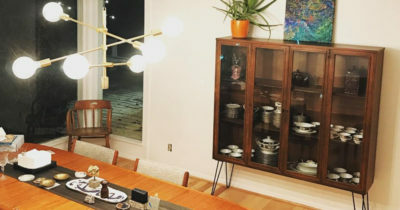 But given enough color choices you’ll be able to select from higher-priced materials, softer hides, and rugs of many different locations worldwide from Texas to Brazil. If you’re ever concerned about a particular rug do a quick Google search on the manufacturer. You might find related reviews or find a contact page on their website. But generally speaking every rug in this post is excellent quality. No matter what size or style you’re looking for I guarantee you’ll find something here. If you want something modern and chic then take a look at the Brindle White Belly Cowhide. It’s a slightly oversized rug that goes well in any living room, bedroom, or study. It’s a white belly cowhide which means the hairs on the edges & the bottom suede are all white. This can get dirty if it’s placed on a highly-traversed area but it shouldn’t be tough to clean. When you first get this rug it may have a very faint leather smell. But it goes away quickly and ultimately just blends in with the room. Colors generally match a white & dark brown shade with a good majority of brown. These rugs measure about 6 feet wide by 6.5 feet long and they vary slightly due to cow size. Some can even measure up to 7 feet! Also note that some of these rugs may have branding marks underneath the pelt, but they’re hidden discreetly by the manufacturer. If you’re concerned about branding feel free to send a message to the seller and ask. I would think most people would be very happy with this hide, specifically if you like the size and want the brown+white mix. 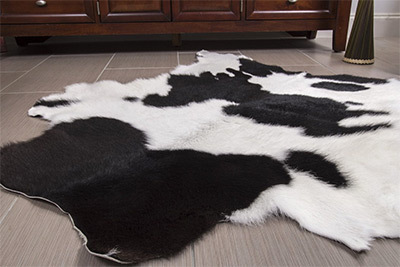 The traditional black & white cowhide rug is a classic for any home decor enthusiast. 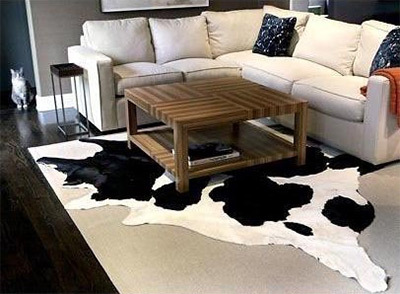 This is what most people think of when they hear “cowhide” and this particular rug has a beautiful shine. Each rug does vary slightly but the majority are 6.5 x 5.5 ft and they have a longer end near the tail. They’re all completely unique since they’re pulled from different cows, each with their own pattern. But no matter what pattern you get it’ll have the black & white color made with 100% genuine cowhide. Surprisingly these rugs can weigh a lot—and that’s a good thing! This rug on average weighs about 10 lbs when rolled up, although the weight can disperse a bit when fully laid out. All hairs on the rug are mostly shorter hairs and they don’t shed. You should be able to vacuum over the rug no problem and it feels incredibly soft under your feet. Just make sure you like the black & white contrast because it can be very stark. As long as your room can tolerate the bright checker-style color pattern you’ll adore this area rug. It’s not very common to find grey rugs but the team at eCowhides offers this XL grey cowhide rug with a brilliant sparkling design. This color is incredibly unique and certainly not the most common choice out there. In fact you’ll probably need a room style that can accommodate such a dazzling shade of grey and silver. The extra large grey cowhide measures about 7.5 ft long by 6.5 ft wide. The very center of the rug contains the most variety of color with the outskirts blending more into lighter white and gray. You may even notice some very light brown in the pelt. It’s a gorgeous mix that’s sure to please the eye. For whatever reason this cowhide may have a stronger smell of leather or suede than others. But the smell dissipates quickly and mostly occurs right after unboxing. All the hairs are pretty long but they’re not very soft. Granted they’re not harsh like bristles either, but this does feel more like a true leather cowhide rug. The hairs don’t make a huge difference in softness but they are shiny. If your decorating style can mesh nicely with this dark grey/brown color scheme then look into grabbing a copy. 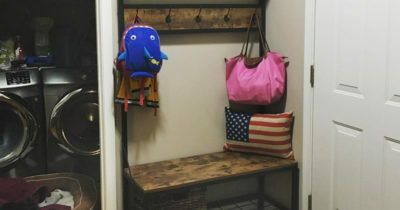 It’s far from the perfect solution for everyone, but the unique color along with the oversized design make it a great fit in the right residence. Tricolored cowhide rugs offer a splash of individuality and that’s exactly what you get with this black swan cowhide. It’s actually a very unique design and no two cowhides are alike. You’ll get a rug measuring about 6′ x 6′ and it’ll usually be a tad longer than wider. Some rugs may have a tail distinct, others may have two flaps near the shoulders/neck of the cowhide. Either way each design is unique so ordering this rug can feel like a mystery grab bag. The colors can be very bright or very dark depending on the model you get. If you are concerned you can try contacting the sellers to send you a picture. Granted when you get the rug it’ll probably look a little different in person, but a photo can ease your qualms about getting a pattern you don’t love. Mostly you’ll just have dots or spots in different areas with a variety of browns & beiges. You won’t find any dark black spots on this particular hide. Now this is also a cheaper model which can be worrisome if you’re looking for quality. But the fur is very soft and for the price it’s practically a steal. Consider picking up a rug like this if you like the tricolor design and want some variety in your living space. With a soft suede backside and a super hairy cover the Panda Hairy Rodeo Cowhide is the softest rug you’ll find in this color. Unfortunately it’s also a pretty small rug measuring about 3′ x 3.5′, often a bit longer than wider. It does have a strong black and white pattern but don’t let the name fool you. It certainly does not look like a panda’s hide; this is clearly a cowhide, and a beautiful one at that! This model comes with 1 inch long hair so it’s much thicker than most rugs. It’s all real fur from the cow and the hide is 100% genuine. This also means the hide’s pattern varies from animal to animal which can give your home a unique aesthetic. One thing I don’t like about this rug is the weight. It only weighs about 2-3 lbs which is fairly light. This probably won’t lead to curled edges but it’s a good idea to keep this out of moist areas. But the biggest thing to consider is the actual size. It really is a small rug so make sure you’re okay with that before buying. To visualize the size find a yardstick(or use a ruler 3 times) and measure a general “boxy” area of 1 yard/3 feet. This is about how large the hide will be. It might fit on your coffee table, on the back of your recliner, or maybe under some furniture in the living room. But it probably won’t feel like a true area rug, and if you’re OK with this smaller size then by all means grab one. 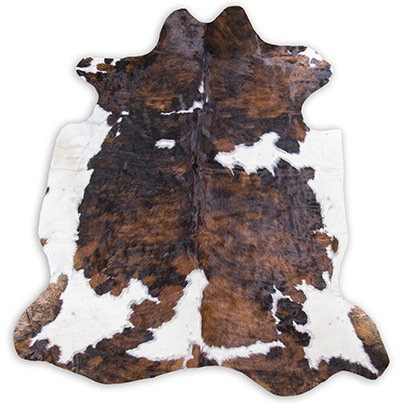 The much larger Butter Rodeo Cowhide Rug is brown and clean with the same longer hairs from other Rodeo cowhides. It measures about 7′ x 6′ which should be large enough for any room in the house. These rugs all come as byproducts of the meat industry so no cows are purposefully pushed through just for their hide. This hide in particular uses cows from Brazil but it’s manufactured in the USA. 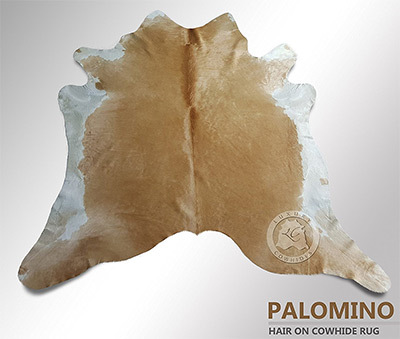 Each cowhide goes through an extensive tanning process which ensures a very soft feeling while keeping all the hairs intact. Unfortunately this can also lead to a strong leathery smell in the rug. This usually airs out quickly within a few days so if you’re not thrilled with the smell you can hang it outside for a few days. The more important thing to focus on is the color. 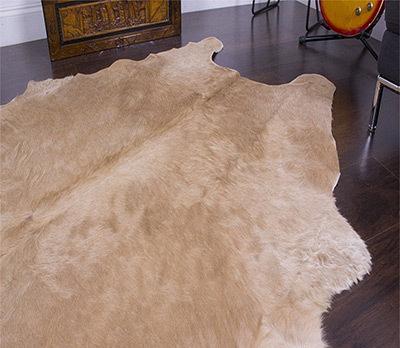 This butter cowhide rug does have a very light mocha brown shade across the entire rug. The edges may have small tints of white, but the vast majority of the rug is bright tan. With this larger size you also get a heavier rug weighing almost 20 lbs. This weight is proof to the durability and strength of this hide. It’ll do well in a room with heavy foot traffic and it should hold up for years to come. Your hide’s color may differ slightly but the photo is very accurate. If you like the color in the photo then you’re guaranteed to love the hide in person. Mixed colors often feel more vivacious and down-to-earth. This is definitely true of the Rodeo Cream/Caramel Rug using a brilliant blend of white and mocha brown. Since each cowhide comes from a different animal the designs are very unique. There is no single guaranteed pattern you can ask for. The rug will have the white & brown mix but you’ll get a random ratio of white to brown, plus the brown color can vary greatly too. This is a very small rug measuring a general square of 3 feet by 3 feet. It looks a lot smaller in person but this can work well as a small accent piece. 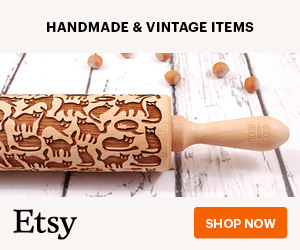 I’d avoid using this as an area rug or a full-room rug. You’d probably need something about double the size to really fill up the room. But this can work nicely as a throw or as a corner rug. And unlike other Rodeo rugs this one does have fairly small hairs. Not too small and certainly not disappointing, but nothing to write home about. Overall it’s a cute little rug if you can appreciate the variety of color. It’ll be pretty small too so if you know this 3×3 rug can fit then you’ll be happy with the purchase. Make room cowboys cause this exotic brown cowhide rug is the most flexible and sturdy area rug with a western feel. It comes with a suede back and semi-long hairs in a solid brown color. They may all seem very similar but one foot can make a big difference. 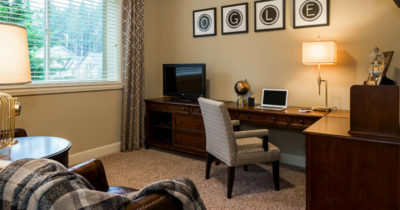 Since you have so many sizes to pick from it’s a good idea to measure your room beforehand. 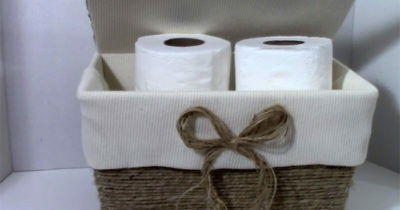 Also make sure your decorating style can mesh nicely with this brown color. There will be some difference in the final product but it won’t be much. They all have that light brindle color and the biggest difference is in the amount of darker or lighter spots on the hide. Each hide has the same semi-long hairs and they don’t shed at all. Completely safe for cleaning and vacuuming along with heavy use in homes with lots of people. It doesn’t have a very strong scent but it can be aired outside if needed. And even though this rug is a bit lighter it certainly doesn’t come with any risk of curling. 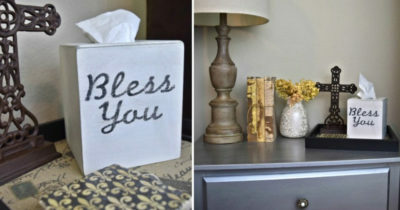 A win-win for any country lovin’ homeowner who adores the brown color scheme. The whiter hides are typically much harder to find and more expensive too. But this natural white cowhide rug is a beaut and very affordable. It measures about 6′ wide by 7′ long and may have slight variations in the style. It’s generally a very bright rug with a good majority of white in the color scheme. The back is all suede and it’s made very thick to be durable in any room. All hairs are short enough to not stand out, yet they’re long enough to keep the rug soft. They do not shed and you’ll be able to vacuum or clean up anything off the hairs. 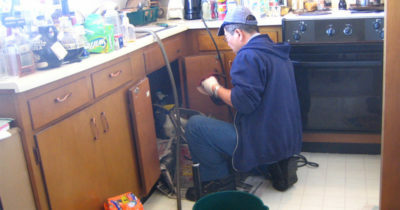 But you do need to be careful about spills or stains. White is a well-known problem color for soaking up wine, juice, beer, mac & cheese, or anything similar. The best you can do is keep an eye on it and try to keep any potential staining materials away from the cowhide. The color really is phenomenal so if you’re OK with the risk of a white rug then you’ll love the design. Some parts of the rug may have small brown marks but the majority is all white. It’s also very heavy so you’re guaranteed to get a curl-free rug for your home. 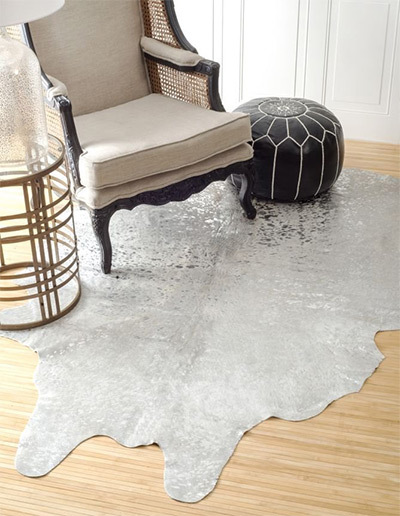 Perhaps the most unique cowhide rug I’ve ever seen, this silver color jumps off the floor and really captures the eye. In this 5′ x 7′ cowhide rug you’ll find a sparkling silver texture with very light hairs. It goes through a complex tanning & finishing process which results in over 3 months of styling, deep chemical treatments, and finalizing with sewing/stitching. 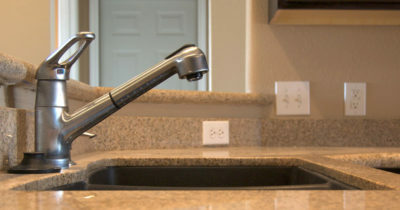 The top layer is almost stain resistant and the color won’t be at risk for unsightly marks. The very back of the rug uses a suede finish to keep it heavy and firmly planted on the ground. I’m not exactly sure what makes the bright silver spots on the hide, but they sure are noticeable and they’re very unique. If you don’t want a bright rug then try looking at other models cause this one is bright. Not only does the grey/silver pelt shine in the light, but the silvery spots can pick up & reflect sunlight easily. They certainly won’t blind you but there can be a strong reflection. Bottom line this cowhide is strong, noticeable, and heavily customized. You’ll never find anything else like it. As long as your home can absorb this color naturally you’ll be very pleased with this rug. The brilliant speckles in this rug almost take on a painterly look. 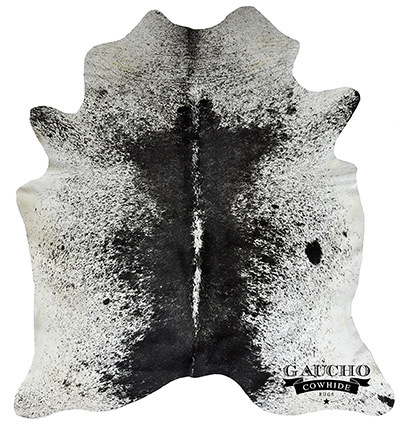 Gaucho’s Snowie Black & White Cowhide is exceptional in both style and build quality. This rug typically measures about 6′ wide by 6.5′ long and comes in a variety of shapes. All materials are environment-friendly including the entire tanning process. This keeps the hide strong without damaging any of the hairs. The actual design follows an interesting black & white pattern that feels a bit like salt & pepper. The central cowhide does have the most condensed area of black, although there is no guaranteed ratio to the pattern you’ll get. One thing’s for sure though: this rug feels high quality and the “snowie” design style remains consistent in all areas. The hairs aren’t too long but they are shiny and draw plenty of attention. If you like the unique black and white speckled design then you’ll appreciate this accent in your home. Just make sure you have the room for it on the floor. Measure out a spot ranging from 6′-7′ with variable width & length. I haven’t seen too many coffee-colored cowhides but this Palomino rug takes the proverbial cake. It doesn’t feel unnatural but it does have a certain “manufactured” sense to the design. Some people may not like this style and might prefer a more speckled organic-looking cowhide. 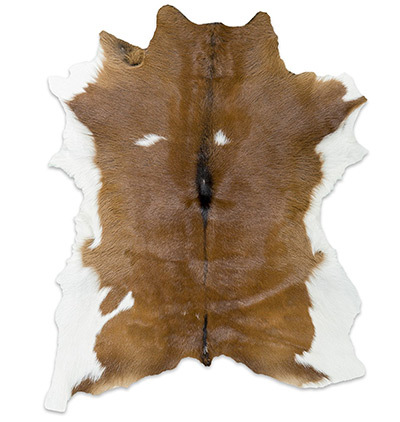 But rest assured this cowhide rug is genuine with natural hairs and a traditional tanning process. The typical rug measures about 5 ft x 7 ft with a wide assortment of patterns. Each cowhide is different but they all have this same same light tan/coffee color mixed with spots of white. Hairs are very short but still incredibly soft and shiny. You can spend all day running your fingers through this rug and still be amazed at the softness. Unfortunately it does feel a bit thin compared to others of the same size. However I wouldn’t say this rug has any risk of being damaged or falling apart like some cheap models. I think it has to do with the tanning process that may lighten the hide or make it a touch thinner than most. Either way the colors are fantastic and for a large 7′ long rug I think the price is right. If you enjoy the caramel coffee beige then you’ll feel right at home with this piece in your living room. 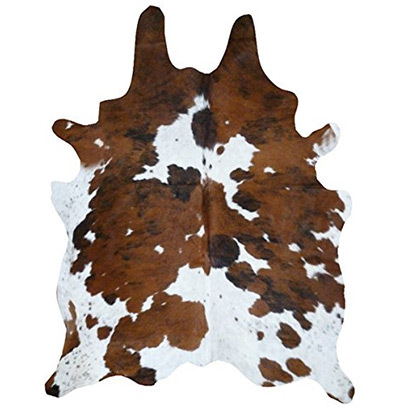 Natural tricolor cowhide rugs are exceptionally rare. But this tricolor Rodeo rug is one of the few top-quality items I recommend for anyone who appreciates a bit of rugged home decor. The rug comes with a solid white base and a wide variety of patterns for the brown spots. These can be very light tan, super dark brown, or an intermediate shade similar to peanut butter. Or anything else inbetween! Even the smallest sized rug is fairly large so this works well as an area rug. If you have room in your home for a genuine cowhide rug and like the tricolor design then you’ll fall in love with this model. Rodeo makes quality rugs and they’re all incredibly soft. This particular rug doesn’t have super long hairs, but the hairs are very soft and shiny in the light. The tanning process is strong on the hide but gentle on the hairs. You shouldn’t find many(or any) bald patches regardless of the size. Just make sure you like this tricolor design before ordering. Rodeo does not guarantee any particular color scheme so there’s a lot of room for variation. But if like the multicolored brown hide pattern then you’ll like the comfy atmosphere this gives to the room. It’s a one-of-a-kind piece and practically made for an area rug. 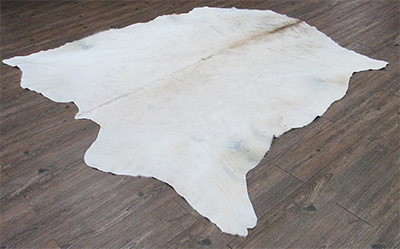 It should be clear that no single cowhide rug is the “best” considering all the different sizes and colors to pick from. 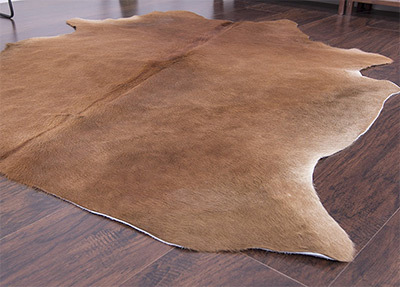 But all of these cowhide manufacturers are top notch and guaranteed to offer great quality pieces. Your color scheme preferences may vary but all of these designs are phenomenal. If you want my vote for the best traditional long-hair cowhide rug then I say the snowy black & white model is superb. The great thing about cowhides is that you can shop around with a ton of variation. 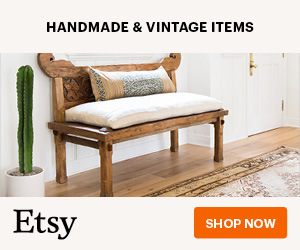 Whether you’re looking for a multi-colored cowhide, a creamy brown/beige cowhide, or the traditional black & white style you’re bound to find something that’ll fit right at home.